More on the monorail story we mentioned yesterday…. 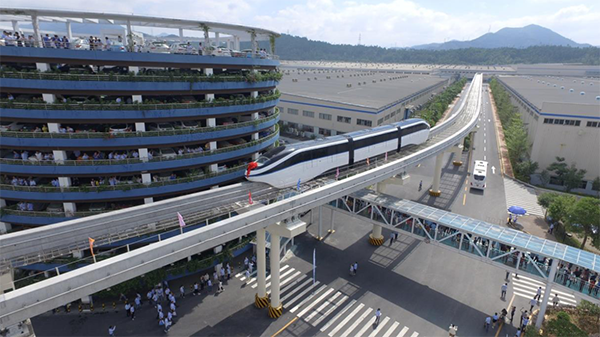 A BYD monorail at the firm’s global headquarters in Shenzhen, China. Credit: BYD. During a radio interview earlier this week, L.A. Mayor Eric Garcetti said the thought a monorail might be one solution for building transit over the Sepulveda Pass. He also mentioned BYD, a Chinese car, electric bus and battery manufacturer with its American headquarters in L.A.
Here’s a good Wall Street Journal article from last year on BYD’s monorail efforts. Would it work for the Sepulveda Pass? Hard to say at this time. Much of the talk and early studies up to now has focused on a transit tunnel because of the hills on either side of the pass (the San Fernando side is steeper a slope averaging five percent) and the width of the pass. Adds two ExpressLanes in each direction along the I-405 from I-10 to US-101, while maintaining current general purpose lanes, to provide express bus service connecting the San Fernando Valley to Westwood. An 8.8-mile high-capacity transit project between the Orange Line’s Van Nuys Station and the Purple Line Extension’s Wilshire/Westwood Station with a stop on the UCLA campus. Ten-mile high-capacity transit and rail extension from Wilshire/Westwood Station to the Airport Metro Connector. Project could also add ExpressLanes along the I-405 that provides express bus service connecting Westwood to LAX. The Measure M spending plan had the ExpressLanes opening in the 2026-28 timeframe, the transit line between the Orange Line and Purple Line in 2033-25 and the section from the Purple Line to LAX in 2057-59. I know the above timelines are a wee bit intimidating given that my calendar shows us only in mid-2017 at this time. But Metro is exploring public private partnerships to provide the funds to accelerate the project. In February, Metro announced that two such proposals for the Sepulveda Pass project had passed the initial concept review stage and were entering a deeper analysis of their worthiness. As the LAT story notes, monorails have been discussed over the years in our region. Thus far the Disneyland monorail is the only one built. 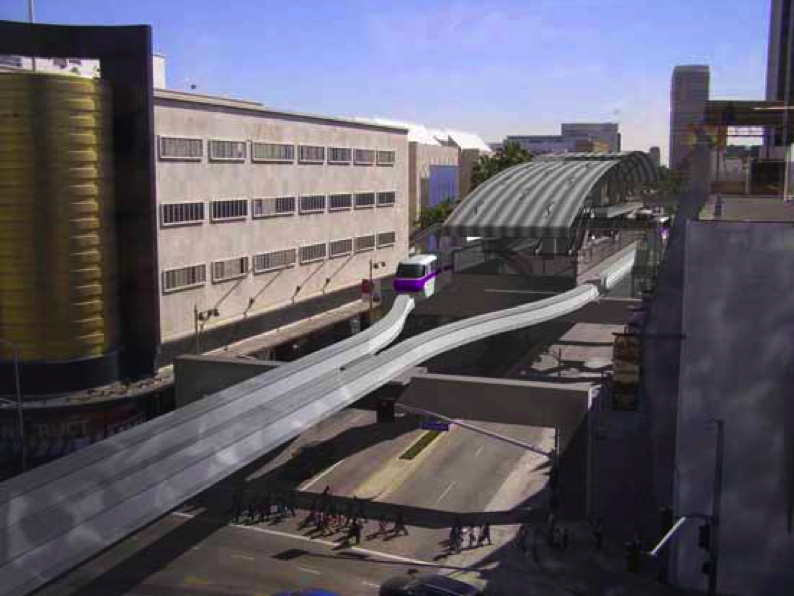 Monorails were looked at in early studies for the Purple Line Extension but the idea was discarded because of concerns about capacity, speed, forcing people to transfer from train to monorail and the infrastructure overwhelming the streetscape of Wilshire Boulevard. A rendering from an early Purple Line Extension study. Credit: Metro. I know there are some Monorail Enthusiasts who visit our blog. But let’s face it: when it comes to transit around the world, trains are much more common than monorails. Stay tuned! A long interview with Metro’s CEO that touches on many issues ranging from Measure M to ridership to cuts proposed by the Trump Administration to federal funds for building transit projects — such as section three of the Purple Line subway between Century City and Westwood. I was very surprised to see three cities in particular—Denver, Los Angeles, and Seattle—called out in President Trump’s budget as not meriting federal funding because they had already raised local money. That was a complete shock to me. The idea that regions that have gone out and raised money on their own—like we did with Measure R and Measure M—should be penalized by losing federal funds is disastrous. We responded very aggressively to that, saying that regions that invest in themselves should be rewarded. The issue involves the federal New Starts program. The Trump budget proposal would limit funding to projects that have already qualified for New Starts and finalized deals with the feds. No new projects would get meaning, meaning projects on the verge of signing agreements with the feds — i.e. section three — must wait to see if the funding comes through as part of a budget deal between the President and Congress. Stay tuned. Dept. of Climate: It’s mid-June and snow is still piled high at high elevations in the Sierra. It’s going to be a tricky backpacking season in the Sierra for active transportationers headed to the mountains. My annual trip to the Sierra Internet Free Zone has been pushed back to Labor Day. On a typical weekday, TNCs make more than 170,000 vehicle trips within San Francisco, approximately 12 times the number of taxi trips, representing 15% of all intra-San Francisco vehicle trips. On an average weekday, more than 5,700 TNC vehicles operate on San Francisco streets during the peak period. On Fridays, over 6,500 TNC vehicles are on the street at the peak. TNCs drive approximately 570,000 vehicle miles within San Francisco on a typical weekday. This accounts for 20% of all local daily vehicle miles traveled (VMT) and includes both in-service and out-of-service mileage. Taken over total weekday VMT, which includes regional trips, local TNC trips account for an estimated 6.5% of total weekday vehicle miles traveled. Why is this interesting? Well, San Francisco has a pretty good transit network and is pretty pedestrian friendly in many places. And still Uber, Lyft, etc. have managed to build a pretty big business there. Of course, more than 30 percent of San Francisco households have no cars — in L.A. County that rate is usually between five and 10 percent, depending on the city. Still, the S.F. study suggests that not having a car is not the same as not using cars. Those with long memories may recall that initial proposals for the Regional Connectorcalled it for it running at street level through DTLA. That was met with a lot of resistance and Metro eventually decided to build the project underground. It certainly raised the cost of the project — it’s budgeted at $1.756 billion — but it will almost certainly be a much better project as a result with faster trains and more capacity than if trains sat idling at even more traffic lights. Metro is studying whether to move the station two-thirds of a mile to the east to improve access for pedestrians, cyclists and transit users — and make the station a 15-minute, three-quarter mile walk from CSUN. Here’s a recent Metro presentation (scroll down for the section on relocation). A study on the move is expected in the fall. Obviously cost and funding will be an issue. At this time, 21 trains on Metrolink’s Ventura County Line stop at the station each weekday and the line has a ridership of about 3,945 on the average weekday, according to Metrolink. What are the drawbacks of an elevated light rail compared to a monorail along the 405 freeway? There are several disadvantages to elevated Light Rail, vs. Monorail. Light rail requires a lot bigger platform above, blocking light and view. Light Rail requires the frequent replacement of tracks that wear out. Light Rail (especially on turns), makes a steel to steel ear piercing squeal; and Monorails are quiet. When a Light rail goes by if you are on the ground having a conversation, you have to stop while it passes. With Monorail, there’s a soft swish noise and that is all. Light rail cannot climb long steep hills, while a monorail will easily climb right over the hills. With both Light Rail and Monorail being built with tax dollars, the cost of maintaining Elevated Light Rail is high and causes Light Rail to lose money and needs continued tax funding. A Monorail, once built. should show a profit; as operating costs are far lower; which saves the taxpayers money. Check the facts… The Seattle Monorail makes a profit. If the Las Vegas Monorail had been built using tax money like light rail is built using, the Las Vegas Monorail would be showing a substantial profit. With Light Rail, to get on the other side of those steep hills, a very expensive tunnel must be built. Monorail, put standards in the middle of the freeway where the cement protection is and it goes right “over” the hill. Was something like the Getty Center tram ever considered? It works for them, though I’m guessing it might not be the high capacity solution you’d be looking for. No, it is not a high capacity system, nor is it very fast. Otis Hovair systems are not appropriate for this application. Any transit solution in the Sepulveda Pass MUST connect to something. Nobody is going to (1) drive north (or south) on the 405, (2) park, (3) get on a train, (4) and walk to their destination. The same is true for the north terminus of the 710: a transit solution is idotic. You have to be able to get on a train in Canoga Park or Northridge (for example), maybe transfer to another train, THEN walk to your job on Miracle Mile or Santa Monica. Otherwise putting a train in the Sepulveda Pass is useless. Unless they put Lard Lad donut shop nearby for the monorail anchor to grab. The second phase of the project would build a transit project between the Orange Line and Purple Line — those are pretty good transit connections on both sides of the pass. The third phase to LAX could hypothetically connect to the Expo Line and Crenshaw/LAX Line. The studies will sort all that out. But it’s important to stress that the goal of the project as defined in Measure M is to provide transfers to the Orange Line and Purple Line. Totally agree that’s crucial! You forgot one monorail. Years ago the LA County Fair had one. Late 60’s? It existed into the late 1980’s or early 1990’s. Thank you for mentioning that. I added the video to the post. I didn’t know the monorail existed! Well, to really date myself, I was at the LA County Fair because my buddy got passes for delivering the Herald-Examiner! Note: there already exists a monorail in the Sepulveda Pass, privately operated by the Getty Center (yes, the tram is apparently a small monorail, according to Wikipedia). It can handle the pass’s steep slopes to and from the museum pretty well, and, although it only goes 12mph, that still is faster than traffic on the 405 at times. In 65 or 66, Busch Gardens opened next to the Busch brewery in Van Nuys. It had a monorail. In the 70s the gardens were removed for expansion of the brewery. >I know there are some Monorail Enthusiasts who visit our blog. But let’s face it: when it comes to transit around the world, trains are much more common than monorails. Yes, they’re more common. That doesn’t mean they’re the best choice. There are many reasons why cities around the world have been taking down their elevated trains, and why many others have built monorail or are seriously considering them. It is a solid, proven, reliable and affordable mass transportation solution. I have a safety concern about the monorail pictured from the fair in 1988. If the train stops, and there is a fire on board, how are people going to escape? The way it is designed alone will be difficult for passengers wh are disabled and have mobility problems. This idea is still in its “sci-fi” stages. We need to turn off the TV and face the actual realities and apply what currently works best now instead of waiting decades for “sci-fi” dreams to come true. The LA County Fairplex Monorail was poorly designed and built. the track on one occasion came un-welded and the car was left dangling. The system only ran at 5 mph. The fair finally sold it to some people-mover project in China and it is no longer in the U.S.